Things I liked: This was my first AO variable power scope but I've used several on friend's guns. I really feel this provide great value. I shoot a Hatsan 95 Vortex and these guns are known to to hard on scopes. In fact, my gun, while zeroing the scope, damaged it's seal and the shot cycle was so violent it turned on the IR system without me even touching the button. Twice. Now you'd think that kind of violent action would toast a scope. Nope. I've had it for about 2 years now and it works flawlessly. Clear glass, great eye relief for me and I wear high prescription glasses, progressive lenses, when I shoot. Most scopes don't give me much opportunity to get a sight picture. Not a problem with this scope at all. The IR works great but I've not really had a need to use it. I also have my scope mounted in a one piece mount. Things I would have changed: Now that I've had this scope and used it as much as I have, I know my next/future scopes will be side focus. It's so much easier and more convenient. But it costs more too. I wish it was a tad smaller and lighter but for the durability and relative low cost, I'm fine with it. What others should know: The UTG True Strength scopes work well for me. I know that there's going to be one here or there that fail, but over all I feel great confidence in the line. Enough so that I have a couple on my wish list here for future purchase, and review. Things I liked: Clear scope all the way to 16 power. Things I would have changed: Originally had this scope on a Hatsan 95 then put it on my Benjamin Discovery PCP. I don't think it should be rated for a springer. What others should know: Purchased 1 of these, it went bad (Losing zero) after about 500 shots. It would scatter pellets at 20 yards. Sent it back, PA replaced it with the same scope but a new one. Just sent that one back as well. Scope is good at first and you can put pellets into the same hole and then it will start to move. This happened after about 200 pellets. Get it re-sighted and after I would pump up my Disco, the scope was off again. Re-zero and it is good for a while then off again. Maybe they had a bad lot of scopes? I would not purchase one of these scopes. I replaced this with a more expensive Hawke scope that I have not received yet. Things I liked: Incredibly accurate scope for the price. I installed it on a .25 Hatsan Flashpup QE. After zeroing it in, I haven't had to do anything with it for the last 5 months. I shoot with it nearly every day. Nice clarity. At 70 yards and at rest, nearly impossible to miss. Getting 1/2" groupings on a consistent basis. I have no complaints at all using this scope. What others should know: If you are purchasing the 25 Hatsan Flashpup QE, you may want to consider using this scope. Things I liked: It is durable. Things I would have changed: Lessen bulk and weight, change the mil-dots out and put a duplex or other cross hair not blocking out field of view or target or things to side of target. The lens system inside the goliath tube is a bit misleading to the scope's exit pupil--it is hard to find the exact place to put your eye. What others should know: I dislike all "air gun" scopes and use only centerfire or rimfire scopes. Other strict air gunners have hordes of "air rated" scopes - and enjoy them. Things I would have changed: Needs more elevation adjustment. What others should know: I wouldn't buy another. Things I liked: I have bought two of these scopes. A good value for the money. Zeroed my .25 Marauder at 20 yards and hit small game anywhere between 20 and 50 yards with no adjustment. The green and red illuminated feature works great and does make a difference in low light conditions. Also comes with a spare battery. What others should know: One of the better scopes for the money. I have had no issues with mine. Things I liked: So far the scope is working great on the crosman Quest 22cal. This gun is putting out 20fpe. The scope is holding zero and very clear. About 300 shots through the gun. Things I would have changed: Nothing. It was a better scope than the one that came with the gun and was not too expensive. What others should know: I had to shim medium rings to keep the objective bell off the gun. The lense cap will still not fit. So get high rings if mounting to 3/8 dovetail. Things I liked: This is a great scope for the money. I paired this scope with my Umarex Gauntlet. They came in a combo. The scope is clear and has a paralax setting that actually helps you to find the yardage on your target when you are using the higher powers. The illumination is nice. Things I would have changed: One thing that I don't like is that the illumination is visible around the edges as you look through the scope. I like to look through an illuminated scope and not see the source of the illumination source. It is really not that significant however. What others should know: I think that for the price this scope is sweet, pairs well with air rifles. Things I liked: This scope was recommended by Pyramyd for the RWS 54. The scope works very well and like the mil dots when compensating for wind. I didn't install the battery for the EZ-TAP because I don't really need it for the type of shooting I do. Focus works very well thru out the different distances. I get a good crisp sight picture. Things I would have changed: Would like to see finer/thinner lines in the reticle. 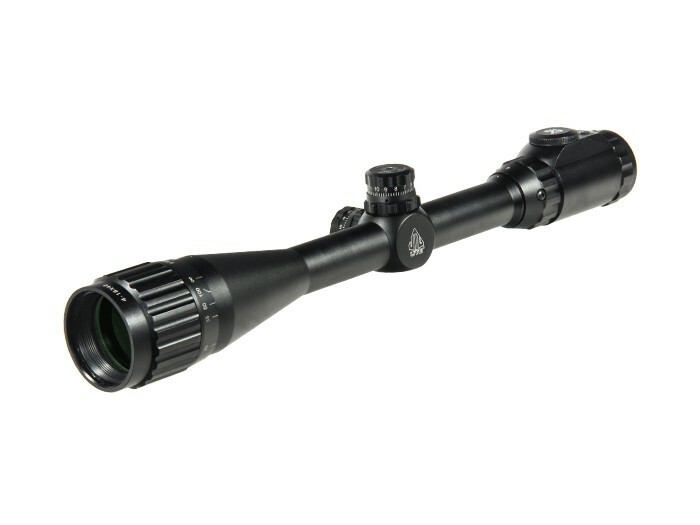 What others should know: I've tried several different scopes and the Leapers is the only one that has held zero. A heavy scope so I'm sure it's beefed up internally to handle the recoil of the 54. Wish I had started with this scope would have saved a lot of head scratching. Things I liked: This thing is the cats meow. Love it, got it with a bundle deal whenever I bought my Gaunlet have only used it out to about 35 yards. Came with rubber dust covers. What others should know: Easy to see mill dots. Illuminated cross hairs. Things I liked: Dead on after 4 months and 4,000 pellets through my Umarex Gauntlet PCP. Impressive results at 20 and 40 yards. I have not gone further. Clear and easy to use. Things I would have changed: Removable hood is useless if you are changing distances. Not sure what would replace it. What others should know: This is a PCP rifle with virtually no recoil. However, I have a 30mm of this scope on my Benjamin Mayhem which is a scope killer. It has been on that gun the same amount of time and is still on target. I cannot say it is perfect there because the gun itself has had issues, as has the owner ;) However, that has the same amount of pellets through it, or close to it. I love the challenge of the magnum springer but the accuracy of the PCP. Both are dolefully in use with these scopes. I anticipate the one on the Gauntlet to outlast the springer by many times. Things I liked: Love the colors in reticle, can change for light conditions. Great value planning on getting another for centerfire rifle. Things I would have changed: Nothing, seem great on my umarex gauntlet. Wish it had 1/8" click adjustments for use on my savage 243 win. rifle. Things I liked: quality quality quality utg leapers great. Things I liked: So far everything I've run accross with this scope is meeting all my needs. I've only had a short while and I've mounted it on the Walther Terrus that it came with as well as my Diana AM03 .22 cal. It's very adaptable and has no problem with the higher power and recoil of the Diana. What others should know: Very good quality on an entry level optic. All aspects of the scope work great. Things I liked: I like the magnification of the scope and the resetting the zero feature . I had never considered a UTG scope before but this was offered in the bundle package with my air rifle and the price was right.